Letting the "Power of the Ancient Texts Come Through"
Although Adventism lagged behind Mormonism, the Watchtower, and Christian Science in the publication of their version of the Bible, they have made up for lost time by outperforming these other organizations with numerous printings and changes. 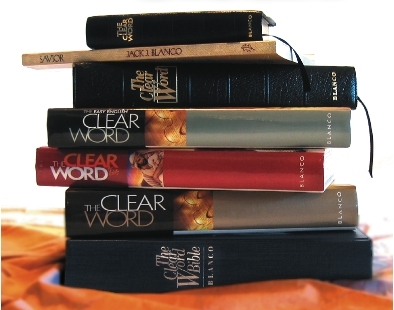 Since its first printing in 1994, The Clear Word Bible has been reworked into no less than seven unique versions of the Scriptures. The seven versions are: The Clear Word Bible, ©1994,2 The Clear Word, ©1994,3 The Clear Word, ©2003,4 The Clear Word, ©2004 (Pocket edition),5 The Easy English Clear Word, ©2005,6 The Clear Word for Kids, ©2005,7 and Savior (The Clear Word version of the gospels, combined into one narrative), © 2008.8 The Clear Word Bible, original edition, has never been recalled or rejected by the Seventh-day Adventist organization. Although some changes have occurred to the text, the church has not publicly called for the original to be removed from circulation. Because the changes to the text in many cases are not directly doctrinal, recalling the early editions would not change the status of this work. After receiving criticism for the title, the publisher removed the word "Bible" from the original The Clear Word Bible, and the words "An Expanded Paraphrase" were added to subsequent printings. These subsequent versions are not just reprintings with modifications to the title. They are different versions containing numerous changes to content throughout the books. Most modern publishers will be honest with their readers, indicating changes to content or revision of materials when books are reprinted. The Review and Herald Publishing Association, however, provides no statement to this effect, leaving the reader to believe that he/she has the same document in hand with only modifications to the title. In the publishing world, this lack of disclosure is tantamount to lying. What is truly shocking, however, are not the changes, but the problematic passages that have remained. Although the back cover of The Clear Word indicates that the author/paraphraser is allowing "the power of the ancient texts [to] come through", he does not indicate that the texts are coming through a very strong Adventist theological lens, replete with quotes and paraphrases from the writings of Ellen G. White. Following we will examine how three Adventist teachings regarding food, Sabbath, and hell have shaped Blanco's thinking resulting in inaccurate wording of the "biblical" text. Then we will look at ten texts dealing with the nature of God. The Clear Word Bible has provided us with the ability finally to see the actual definitions of common Scripture passages that are twisted in the Adventist mind. By comparing The Clear Word passages with accepted translations of the Bible there is no doubt that a spirit other than the Holy Spirit is at work in Adventist theology. Adventism promotes vegetarianism and requires members to follow the Old Testament food laws given through Moses to the Israelites. The Clear Word (TCW) demonstrates that, regardless of what is stated by individual Adventists, the abstinence from certain foods is a major church teaching. Gen. 9:3, ESV: "Every moving thing that lives shall be food for you. And as I gave you the green plants, I give you everything." The words "every" and "everything" are replaced with "many," and "meat" and "vegetables." 1 Timothy 4:1-5, ESV: "Now the Spirit expressly says that in later times some will depart from the faith by devoting themselves to deceitful spirits and teachings of demons, through the insincerity of liars whose consciences are seared, who forbid marriage and require abstinence from foods that God created to be received with thanksgiving by those who believe and know the truth. For everything created by God is good, and nothing is to be rejected if it is received with thanksgiving, for it is made holy by the word of God and prayer." 1 Timothy 4:3-5, TCW: "Others will say that it's wrong to marry and to eat the good things God created which we should receive with gratitude. God created everything. Nothing should be rejected which He has said we can eat, and we should do so by offering thanksgiving and praise. These foods not only have the approval of the word of God, but will also be blessed by Him through our prayers." Once one is indoctrinated into the Adventist worldview, the good things God created "which He has said we can eat" is understood to be vegetables and clean meats according to the Mosaic law. In Adventism it is only the clean meat that has the "approval of the word of God." This deviates from the clear counsel of Paul to Timothy that "nothing is to be rejected if it is received with thanksgiving" and that all food, not only the meat of clean animals, "is made holy by the word of God and prayer." Mark 7:19b, ESV: "(Thus he declared all foods clean.)" The Clear Word in all its versions simply omits this statement. Its omission underscores the Adventist teaching that God requires the observance of the Mosaic food laws. Does the Adventist church really teach that one must keep the seventh-day Sabbath to be saved? Col. 2:16-17, ESV: "Therefore let no one pass judgment on you in questions of food and drink, or with regard to a festival or a new moon or a Sabbath. These are a shadow of the things to come, but the substance belongs to Christ." Col 2:16-17, TCW: "Don't let anyone control your life by giving you a set of ceremonial rules about what to eat, what to drink and which monthly festivals or special Sabbaths to keep. All these rules about ceremonial days were given as a shadow of the reality to come and that reality is Jesus." Col. 2:16-17, Easy English and Clear Word for Kids: "Don't let anyone tell you that you have to go through certain rituals, eat certain foods, keep certain feasts, or observe extra Sabbaths to be saved. All these things pointed forward to Jesus. So now they're meaningless." This passage is one of the clearest implicit examples from Blanco's eisegesis indicating that the keeping of the weekly (not an "extra") Sabbath is something observed by those who are being saved. This Sabbath-requirement is the kind of legalism with which Jesus constantly confronted the Pharisees. It is the kind of legalism that Christians are to avoid, particularly given Paul's stern warning to the "bewitched" Galatian gentiles who were being led into Jewish practices like those taught by the Adventist church and emphasized by Blanco. Matt. 25:46 ESV: "And these will go away into eternal punishment, but the righteous into eternal life." Matt. 25:46, TCW: "I have no choice but to end your lives, because in my kingdom everyone cares about everyone else.'" 2 Peter 2:9, ESV: "then the Lord knows how to rescue the godly from trials, and to keep the unrighteous under punishment until the day of judgment." 2 Peter 2:9, TCW: "From Lot's experience you can see that the Lord knows how to rescue His people but bring the wicked to judgment to face what they have done." The Adventist understanding of the Godhead has undergone many changes. The organizers and influential individuals within the early Advent movement were primarily Arians and other anti-Trinitarians. Co-founder James White, the husband of their "messenger of God," Ellen G. White, was a minister from the Christian Connexion which denied the deity of Jesus. Upon founding the Seventh-day Adventist church, these anti-Trinitarians were not ready to part with the doctrines they had so fervently defined and defended. 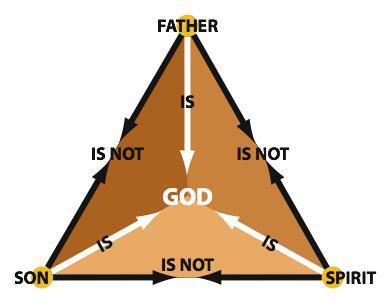 While today's Adventist scholars acknowledge the anti-Trinitarianism of the organization's founders, they assert Adventism now teaches the Trinity. Nevertheless, they have never renounced nor repented of their founding error or corrected its lingering effects. An important book came off the Adventist presses in 2002, titled The Trinity. ESV: Then God said, "Let us make man in our image, after our likeness. So God created man in his own image, in the image of God he created him; male and female he created them. TCW: But this was not the end of His work for that day. Next He said to His Son, "Now let us make beings who look like us and can reflect our thinking and our personality. Let's give them the responsibility of ruling over and caring for the fish, the birds and the animals which we created." So they created two human beings, a male and a female, equal but with different functions, to reflect the unity of the Godhead. Problems: The image of God is a physical characteristic in TCW. John 4:24, however, states that "God is spirit", not a physical body. Further, the Godhead in TCW consists of two united beings, not one Being expressed in three Persons as in accepted translations. Since Blanco admits the Son as being present in creation, why does he not also present the Holy Spirit? The oneness of Adam and Eve was never a way to understand the oneness of the Godhead. Paul uses marriage as a symbol of Christ and his church. The Godhead presented in this passage of TCW is a bi-unity, not a tri-unity. ESV: In the beginning was the Word, and the Word was with God, and the Word was God. TCW: From the beginning, the Word of God was there. The Word stood by the side of God, and the Word was fully God. The Clear Word Bible, original edition, reads, "In the beginning, going further back in time than can be imagined, the Word of God was there. The Word stood by the side of God, and the Word was fully God." Problems: "Further back in time than can be imagined" is not equivalent to "In the beginning." Moreover, "From the beginning" is not equivalent to "In the beginning". "From" connotes something continuing since the beginning. "In" connotes a presence not only at the beginning but also before and after. Standing "by the side of" and being "with" carry different theological meanings. One has to do with physical space, the other with identity or "being". ESV: Jesus said to them, "Truly, truly, I say to you, before Abraham was, I am." TCW: Jesus answered, "Because I existed before Abraham was born." Problems: Jesus is quoting the name of God from Exodus 3:14. In the Septuagint, the Greek reads , which literally translates to I AM. Jesus was not claiming to pre-exist Abraham. He was claiming the title of Almighty God. ESV: I and the Father are one. TCW: You see, my Father and I are so close, we're one. Problems: Jesus' statement has nothing to do with closeness, but with exactness. It has to do with identity of being. TCW implies they are separate entities. The biblical text says they are one. ESV: Philip said to him, "Lord, show us the Father, and it is enough for us." Believe me that I am in the Father and the Father is in me. TCW: Philip spoke up, "Lord, give us just one glimpse of the Father before you go and we'll be satisfied." Believe me when I tell you that the Father would do everything I have done if He were here. Problems: Jesus is not speaking about what the Father would do if he were there. He is making a statement of fact that the Father is literally in him. The Father is present in Jesus. ESV: Do you not believe that I am in the Father and the Father is in me? The words that I say to you I do not speak on my own authority, but the Father who dwells in me does his works. TCW: You must believe me when I tell you that I am the Father in action and that the Father is living out His life in me. All the things I've taught you were not just my own, but the Father's. It's the Father living in me who's doing all this. Problems: For Jesus to state that he is "the Father in action" is (or is bordering on) modalism. The real Jesus does not confuse the persons of the Father and Son. Moreover, Jesus is not confusing the persons of the Father and Son, as "I am the Father in action" would suggest. He literally means He and the Father are separate persons but are in each other. TCW: Thomas stood there speechless. Then fell to his knees and said, "Lord, you're alive! They were right! I believe! You are my Lord and my God." Thomas' words in the original The Clear Word Bible read, "Lord, you're alive! They were right! I believe! You are the Son of God." ESV: For in him all the fullness of God was pleased to dwell. TCW, The Clear Word Bible, original edition: With pleasure the Father acknowledged Him as fully God, in spite of His human nature. More recently, this has been changed to: The Father was pleased to acknowledge the fullness of God in Him. Problems: This paraphrase is problematic, particularly if His human nature detracted from His deity. The actual Scripture does not allow a question about Jesus' human nature. The Adventist teaching about the "sinful nature" of the human Jesus is a direct result of the teaching of Ellen White. Christ's humanity was absolutely perfect. The Clear Word Bible, original edition, paraphrase, has never been recalled as being incorrect. Many still have and use this version for personal study in the Adventist church. Moreover, TCW suggests that the Father was looking on and acknowledging deity in Jesus. The actual Scripture states that the "fullness of God" was pleased to dwell in Jesus, not merely for "part" of God to acknowledge deity in Jesus. The actual Scripture here is reminiscent of God filling the temple in the Old Testament. Jesus the man was also all that God is. ESV: But when the archangel Michael, contending with the devil, was disputing about the body of Moses, he did not presume to pronounce a blasphemous judgment, but said, "The Lord rebuke you." TCW: In contrast to these ungodly men is the Lord Jesus, also called Michael the Archangel, for He is over the entire angelic host. When He was challenged by Satan about His intentions to resurrect Moses, He didn't come at Satan with a blistering attack, nor did He condemn him with mockery. He simply said, "God rebuke you for claiming Moses' body." TCW: Each time He spoke, a beam of light like a two-edged sword came out of His mouth. Problems: Adding extra "information" can be misleading. Hebrews 4:12 compares the word of God to a two-edged sword that judges people. Isaiah 49:2 describes the mouth of the Messianic servant of the Lord as a sword. Ephesians 6:9 identifies the "sword of the Spirit" as "the word of God". The imagery of Revelation 1:16 connotes judgment, not beams of light. In Adventism, numerous concepts of God are equally acceptable, existing simultaneously as shown in the pages of The Clear Word. One can be an Arian, semi-Arian, modalist, anti-Trinitarian, even a Trinitarian and find support for one's position throughout the writings of Adventism, including TCW. The Adventist God is truly an amalgamation. What God has revealed about Himself in the Bible is neither tricky nor difficult. By adding words and using human logic we can trick ourselves, but the glimpse of God that the Bible provides can be stated simply. Analogies are rarely helpful, often generating as many questions as they attempt to answer. The following drawing , however, may help. The Adventists' "new and revolutionary start" is neither new, nor revolutionary. Nor are there a "scant number of Adventist statements on the doctrine of God." Adventist literature is full of often widely-divergent statements about the nature and identity of God. What is scant, perhaps missing entirely, in Adventism, is a willingness to state "we introduced you to a 'Jesus' who was not the eternal, Almighty God. Of this we repent, and we come to the cross to be washed clean by the blood of Jesus Christ." Having received severe criticism following publication of The Clear Word Bible, the Adventist church has continued to make numerous changes to the text. Christians must continue to hold them accountable for altering the words of the Bible until the organization either gives up its efforts to mold Scripture to its doctrines and repents, or they simply get tired of the ongoing changes and allow the world to see them for who they truly are. "And Jesus cried out and said, 'Whoever believes in me, believes not in me but in him who sent me. And whoever sees me sees him who sent me. I have come into the world as light so that whoever believes in me may not remain in darkness. If anyone hears my words and does not keep them, I do not judge him; for I did not come to judge the world but to save the world. The one who rejects me and does not receive my words has a judge; the word that I have spoken will judge him on the last day. For I have not spoken on my own authority, but the Father who sent me has himself given me a commandment—what to say and what to speak. And I know that his commandment is eternal life. What I say, therefore, I say as the Father has told me" (John 12:44-50). 1. Jack J. Blanco, The Clear Word, back cover of hardcover edition, © 2003, Review and Herald® Publishing Association. 2. Jack J. Blanco, The Clear Word Bible, © 1994, Review and Herald® Publishing Association. 3. Jack J. Blanco, The Clear Word, © 1994, Review and Herald® Publishing Association. 4. Jack J. Blanco, The Clear Word, © 2003, Review and Herald® Publishing Association. 5. Jack J. Blanco, The Clear Word, Pocket edition, © 2004, Review and Herald® Publishing Association. 6. Jack J. Blanco, The Easy English Clear Word, © 2005, Review and Herald® Publishing Association. 7. Jack J. Blanco, The Clear Word for Kids, copyright © 2005, Review and Herald® Publishing Association. 8. Jack J. Blanco, Savior, © 2008, Review and Herald® Publishing Association. 9. Jack J. Blanco, The Clear Word, © 2003, Review and Herald® Publishing Association. 10. Woodrow Whidden, Jerry Moon, John W. Reeves, The Trinity, p. 191, © 2002. Review and Herald® Publishing Association. 11. George R. Knight, Questions on Doctrine, Adventist Classic Library, Historical and Theological Introduction to the Annotated Edition, p. xiv, © 2003, Andrews University Press. 12. Crosscurrents in Adventist Christology is now available online and can be found at the following link: http://www.sdanet.org/atissue/books/webster/index.htm. 13. Woodrow Whidden, Jerry Moon, John W. Reeves, The Trinity, p. 202, quoting Fernando Canale, from Doctrine of God, p. 148. © 2002, Review and Herald® Publishing Association. Copyright 2010 Life Assurance Ministries, all rights reserved. Originally titled The Clear Word Bible and released in 1994, this “expanded paraphrase” was written by Jack Blanco, former chair of the religion department at Southern Adventist University. Produced and distributed by the Adventist Review and Herald Publishing Association and its subsidiary Autumn House Publishing, The Clear Word weaves Adventist doctrine seamlessly into the text. This Adventist paraphrase rewrites biblical passages to teach core Adventist doctrines including their “state of the dead” belief that humans do not have spirits that survive death. It eliminates eternal hell, including statements of annihilation instead. This book further incorporates the necessity of keeping the seventh-day Sabbath into New Testament passages, and it downplays the divinity of the Lord Jesus. It also inserts their doctrine of the investigative judgment directly into Daniel 8:14. This website exists to expose the true nature of The Clear Word and to show how it differs from official Bible translations and also paraphrases. It is marketed as a Bible by the Adventist Book Centers, and it is available through a variety of Christian booksellers as well. Consumers need to know that The Clear Word is not merely a paraphrase of the Bible but is written to give “biblical” authority to distinctive Adventist doctrines. It is an “Adventist paraphrase” of Scripture, and it teaches Adventist beliefs subtly but powerfully throughout its amended text.